Reading this after having watched the movie meant that I knew what was going to happen. However, it was still enjoyable and quick/easy. I thought Effie was great character and couldn't believe they had completely left her out of the movie. The strength of this story is not in the predictable and almost soap opera-ish plot, but, in the characters, the richness of their personalities. I spent perhaps a bit too much time a couple nights ago making this map of my travels. My ultimate plan is to scan all my photographs and have the points link to the galleries. If I actually get around to doing that, this will definitely be worth it. 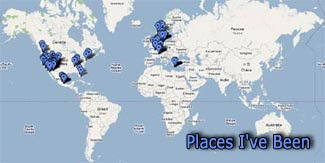 Here's my current top places I want to visit. Of course, there are other places I'd like to go but I did this one a lot quicker.